Prior to my divorce on February 13th and my arrival in Ireland on February 21st, I had felt the constant anxiety one experiences while living in the same sphere with someone who is hiding something. When it lifted, it was very noticeable. I had not been anxious on the airplane, in the airport, or, riding from Dublin to Dundalk. Strangely calm; I tell my sister in a text. When I cast out the sailor to whom I was no longer of value, he quickly discarded me, began a smear campaign (as narcissists do), and waded into the shallows where he belongs. I continue to cut out those who engage in such treachery; those who have enjoyed my loving support but can not give it in return, those who feel they have a right to flim-flamery without being called out for it, those who flatter me to my face while degrading me behind my back. Each time I pluck out a backstabber, three champions spring forth in their place. I have sold Bohemian Farm. My inheritance from my father’s mother: my grandmother Davis. I have rehomed my animals and am freed from all that chained me to America. And yet I have moments where I miss my chains. They were at least familiar. I knew where to go and what to do and how the hob (stove) works. And I knew people and creatures who’ve known me for many years and could stand up their daily encounters with me against the sailor’s seemingly loving and manipulative slights. Now I am all at sea. Untethered and tossed about as flotsam and jetsam. A floating bull. I float down the Arkansas river and join the great Mississippi. I tread water on through Louisiana and out into the gulf of Mexico. Cleaving for terra firma on the one hand and enjoying the uncharted scenery on the other. Some sea cows befriend me as I bump along the coast of Florida. I am dumped into the Atlantic and then pushed down into the Celtic Sea, past St. George’s Channel and finally into the Irish Sea where there are no manatee. I wash up along the Cooley Peninsula and land in County Louth. Like Coco Chanel; I am orphaned and taken in by eccentric aristocrats in Ravensdale. I go into the kitchen of the Georgian house. It is familiar like the houses in the garden district of New Orleans. There are giant wooden shudders on the inside like the ones in my home in Barcelona. They control the temperature in the house. There is a coffee press and a percolator but they are rarely used. Instead, boiling water is poured over instant coffee crystals like my grandmother Irby did. A holdover, I imagine, from her Irish granny; whom she worshipped. Hers was the only house in America where I’d ever seen instant coffee. She called it snuff coffee. Her Appalachian spin. The people at Anaverna read poems and plays rather than watching television. The water that fills the bathtub comes from a river and leaves its silt after bathing. Daffodils are as abundant as they were at Bohemian Farm. Their commonplace numbers, however, in this land, do not diminish their stature. They are sold at country markets and fancy shops and given as thank you’s for donating to charity. 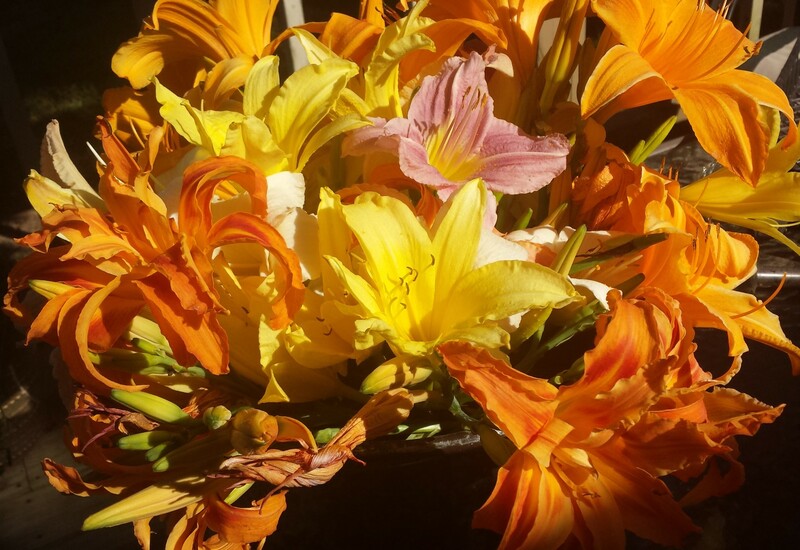 They are appreciated for their sunny glow, sturdiness in bouquets, and ability to beautify the homes they live in front of. I go into the “yard” (the word for stables) to place a flower arrangement. It has been converted into a concert hall and must be readied for the guests. I discover a set of dishes of the same pattern as my mother’s. The same English pattern. It’s as if my mother imagined this for me even before I imagined it for me. Many things in this new land are confusing to me; including the way people show love. But, they are helping me to gain a better understanding of my grandmother Irby (The English surname of my grandfather). I wish I hadn’t tried to put the way she loved me in a box. Her love was unspoken and mostly non-demonstrative. Other than when we were sick or hurt. She was the first on the scene and stayed by the bedside until we were well. The profundity did not rely on kind words to build me up. Our connection existed, and does to this day, on a plane that cannot be walked upon. I imagine her a tree with long sinewy roots escaping from her feet. They travel above ground like a forsythia does and turn gold. The gilded tendrils pierce the bottoms of my feet, root themselves through my veins, and shoot out the top of my head. They are metallic and thin and in long strands and they weave themselves into a crown and tangle in my hair. A hurricane could not tear us apart. The people here drink tea to solve problems and fight the rainy cold. It rains most every day and they complain about the weather most every day. Which makes me so happy. They don’t shy away from gloomy ballads or pretend that the weather is something that it isn’t. They are not easily manipulated. They make me feel calm. When I get into a cab I am reminded of the backward way that grandmother Irby showed me love. (“Benign neglect is what they call it.” An Irish friend explains.) I ask the driver if I can sit in the front seat. “I don’t care if you sit on the roof.” he responds. Or when I go into a cafe and ask the lady at the counter if I can sit outside. “I don’t care if you freeze to death.” she says as she follows me out and fusses over me, sits down at the table with me, and asks me where in America I’m from. And when I ask Thomas if I can eat one of the teacakes on the table, “I don’t care if you eat the whole lot.” he says. At this moment I am in Kenmare. On the Western side of the Island. There is bright shiny sun with a hail shower, a rainbow, and lashing, gale force winds all at the same time. I pour a cup of tea. I walk out into it in my bed-clothes. The cold fills me up. I ask grandmother Davis to hold onto my left ankle and grandmother Irby to hold onto my right one so that I won’t float away. Tá mé go léir ar muir = I’m all at sea.